After Home Loan closure, the most shocking news for any borrower is that one of his original Property Documents Lost by Bank. On last Friday, one of my blog reader Mr. Amarnath Nagpal has gone through same trauma. He wrote a distress mail to me seeking my opinion on what to do next. He was called by his Home Loan Provider (One of reputed PSU bank) to collect his original Property Documents after he closed his Home Loan with the Bank. The situation is no different even if page/s are misplaced by the bank from most critical documents like Sale Deed, Sale Agreement etc. Once the document or page/s are misplaced then the owner will find it very difficult to sell the property or avail loan against property. The buyer of the property will not get Home Loan easily as the banks suspect that property might have been mortgaged with some other lender specially if entire document like sale deed is missing. When you avail Home Loan, all the original documents of property pass through multiple hands before being dispatched to central repository. For most of the banks central repository is in Mumbai. If you request for xerox of documents during Home Loan period then the documents will be pulled out from central repository by the bank. After taking xerox, documents will be again kept in locker of central repository. These central repositories are normally maintained by 3rd party. After the loan is closed, original documents goes through same cycle before being handed over to the owner. 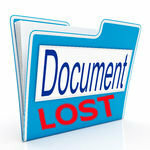 There is always possibility that Original Property Documents Lost by Bank in this process. 1. Don’t accept any original document from bank: If you observe any original document or page/s are missing then it is advisable to return all the original documents back to bank. Bank might insist you to take rest documents & sign acknowledgement. Bank will assure you to locate and handover missing document/pages very soon but be firm on your stand and return all the documents back to bank. 2. Do not sign any acknowledgement/undertaking: Normally banks take acknowledgement/undertaking first before handing over original documents. If you find out that Original Property Documents Lost by Bank then kindly destroy any acknowledgement/undertaking signed by you. Ideally don’t sign the acknowledgement without checking all the documents. Remember once you signed the acknowledgement you can’t claim that document/page is lost by the bank. 3. Register written complaint with bank regarding lost document/s or page/s: Immediately register a written complaint with bank and do mention that original document/s or page/s are missing & lost by the bank. Don’t forget to take acknowledgement from Bank official along with Bank seal. 4. Register Police FIR against bank: If any govt issued document is lost or misplaced, it is mandatory to register Police FIR. In Police FIR, clearly state that Bank has lost your original Document/s or Page/s which you submitted with the bank in original against Home Loan from bank. 5. Submit copy of Police FIR with the Bank: Take acknowledgement from bank that they have received the copy of Police FIR. 6. Submit Court affidavit to registrar of co-operative societies: In affidavit mention that your Original Property Documents Lost by Bank. You may give written request to bank to do the needful as it is bank’s responsibility. This step is required to avoid any fraud. 7. Public Notice in 2 Newspapers: Now the Bank will put a public notice in 2 newspapers (One English Newspaper and Another in Vernacular Language of state e.g. In Maharashtra bank will put notice in English and Marathi newspaper) mentioning Original Property Documents Lost by Bank with your property details in Notice. If anyone has objection from General Public then he/she can file the objection within 15 days. 8. Indemnity bond from bank: In the next step, bank will issue indemnity bond to you on stamp paper stating that original documents lost by bank. The indemnity bond should contain property details, Police FIR details and details of advertisement published in 2 Newspapers. Indemnity bond should be attested & notarized by Govt Notary. 10. Certified copies from registrar office: In next step, bank will obtain certified/duplicate copies from Registrar Office. The bank will submit Police FIR, Duplicate Share Certificate from Housing Society, the Newspaper advertisements and the undertaking at the deputy registrar’s office. Bank will pay the required charges. Registrar will then issue the duplicate copy of the sale deed. 11. Encumbrance Certificate from Registrar Office: Once the process is completed, request for latest Encumbrance Certificate from registrar Office to ensure that everything is fine. 12. File complaint in consumer forum: You may file complaint in Consumer forum and can claim compensation from bank for service deficiency i.e. Original Property Documents Lost by Bank. You can demand compensation equivalent to double the value of your property depending on nature of loss. In such cases decision is always in favor of customer. 13. Penalty on Bank: Besides compensation, bank is also liable to pay 100 Rs per day if there is delay in providing documents beyond 15 days from date of loan closure. This is over and above the compensation for deficiency in service. (a) You need not to do any running around for all the above steps. If Original Property Documents Lost by Bank then It is the responsibility of the bank to close all the above mentioned steps. (b) Entire cost to complete the legal process will be borne by the bank. (c) Take all the documents from bank for your reference i.e. Newspaper Notice, Indemnity Bond, Duplicate Sale deed etc.